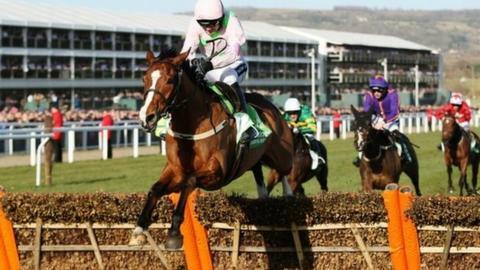 Favourite Faugheen, ridden by Ruby Walsh, won the Champion Hurdle on an amazing first day at the Cheltenham festival for trainer Willie Mullins. The unbeaten seven-year-old led a 1-2-3 for Mullins, with Arctic Fire second and Hurricane Fly third. It completed a hat-trick of race wins for Walsh and Mullins, with the trainer also claiming the fifth race with Glens Melody to secure a 62-1 four-timer. In his final Champion Hurdle, AP McCoy could only finish fourth on Jezki. "I'll leave it for other people to decide if it's my greatest achievement, but it would have to be right up there," Mullins said. The Champion Hurdle win for the Mullins-Walsh combination justified Walsh's decision to ride 4-5 shot Faugheen ahead of Hurricane Fly (8-1), whom he twice rode to victory in the race previously. "The betting suggested it was an easy decision but I knew how they had both been working at home, so it was massive for me," said Walsh. "But Faugheen is an incredible little horse." "At the centre of Willie Mullins's extraordinary day was the 1-2-3 he and his team achieved in the Champion Hurdle. That inevitably draws comparisons with the dominance in the 1983 Cheltenham Gold Cup by trainer Michael Dickinson when his horses, headed by Bregawn, took the first five places. "This, however, has to be rated a greater achievement. The Dickinson quintet were strung out over the Cotswolds, while the Mullins trio had to see off quality opponents, including the now-dethroned 2014 champion Jezki and the high-quality The New One." Walsh and Mullins were all set for a fourth victory in the fifth race, before Walsh's fall at the last on 1-2 favourite Annie Power allowed stablemate Glens Melody (6-1), ridden by Paul Townsend, to capitalise. That success for Mullins equalled Nicky Henderson's record of four winners in one afternoon at the meeting, set on the second day in 2012. "I keep saying to myself, 'enjoy it while it lasts'," he said. "You couldn't write a script like that, but I just knew that all the horses were doing everything right. "We had no sickness, no virus, no bad weather - it was going scarily well, and I thought coming here it was either going to be a great success or a blow-out." The opening race of the Festival saw Walsh romp up the hill aboard the 2-1 favourite Douvan to win the Novices Hurdle by four-and-a-half lengths from stablemate Shaneshill, with Sizing John third in an Irish clean sweep of the places. It was the third year running Walsh, Mullins and owner Rich Ricci had claimed the opener. Walsh and Mullins then landed the Arkle with 4-6 favourite Un De Sceaux, who won by six lengths from God's Own. Mullins was thwarted in the sixth race of the day, though, with Perfect Gentleman fourth behind winner Cause of Causes (8-1), ridden by Jamie Codd. Grand National contender Druids Nephew, ridden by Barry Geraghty, gave trainer Neil Mulholland his first Festival win in the handicap chase. And Irish Cavalier took the final race of the day, Paul Townsend leading the 11-1 shot to victory ahead of favourite Thomas Crapper and Generous Ransom. The action was watched by a record first-day Festival crowd of 63,249 - 6,166 more than last year. Can Van Gaal save Man Utd's season? Read more on Can Louis van Gaal save Manchester United's season?